Colton loves telling a story no matter what medium it's in. From TV to radio, he just wants his stories to touch lives. His stories have been heard daily by hundreds of thousands of listeners during Arizona's #1 rated morning drive program "Arizona's Morning News with Ned and Connie". Colton contributes daily to the afternoon newscasts as well. He's even taken the anchor position, anchoring nightly. Read his bio here! Colton has been heard nationally on ABC News as a stringer as well. 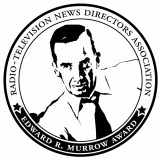 Colton was humbled to receive a Murrow Award from the RTDNA so early into his career. The feature piece that garnered him the award profiled a Valley haunted maze. He remembers his news director told him to go out and do a longform on it for the morning drive the next day. Colton, who is fearless, took the challenge. He stayed at the station until 3AM finishing the piece. Listen! Besides having his name on his own Murrow, Colton has been featured and directly apart of KTAR's Murrow Award winning team for Best Team Coverage in 2010 and 2009. Colton was surprised to find out he won two Mark Twain Associated Press awards this year! He took home the AP award for Best Light Feature and Best Use of Sound: Hard News. The 2010 piece that won Colton the Murrow Award also garnered him an Associated Press award. Of the 68 entries received in the Features and News radio competitions during the academic year, 10 students' work qualified them for the semi-final round of judging. From that round, 5 radio finalists were selected to participate in the National Broadcast News Championship in San Francisco. Read more and listen!